In recent years, the Government of India has been making aggressive efforts to expand access to energy through various national and state schemes to enhance clean energy access. Efforts are also being made to channel and deploy private funding into effective energy projects. Energy access is a priority for India and access to energy is fundamental to achieve equitable growth. In our effort to drive greater and more effective investment in the “Energy” sector , we are organising a half-day gathering to bring together a group of investors and funders’ working in this sector. 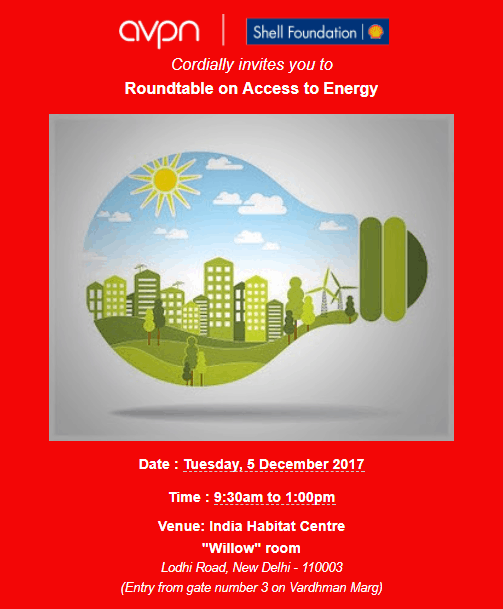 This Roundtable, in partnership with Shell Foundation, will provide an opportunity to engage with and learn about some best practices and success stories in the sector. Practicing experts and thought leaders will have opportunities to share different approaches to investing as well as address some of the current gaps and challenges in the sector. We invite you to be present in this meet and share your valuable inputs as well as hear from others working in this field. To register or find out more, please contact Moushumi Banerjee at moushumi@avpn.asia. Shell Foundation is an independent UK-registered charity established by the Shell Group in 2000 to create and scale new solutions to global development challenges. We apply business thinking to major social and environmental issues linked to the energy sector – and seek to leverage the skills and networks of Shell where possible to deliver greater development impact. Shell Foundation works with a small number of entrepreneurial partners to identify the market failures that underpin many of the world’s problems and co-creates new social enterprises to solve them. Shell Foundation has been working since 2002 to increase the provision of energy to the poor through the innovation and scale-up of decentralised energy solutions, such as solar lighting, biogas, biomass gasification, and the sale of low-cost energy products.